We made it out to see the Glashoffs — a great little farm in the Suisun Valley — just in time for walnut harvest. Take a photo tour of this fifth-generation operation (hint: persimmons, cows, and berry jam!). Or watch an action-packed video of the walnut shaking process on tour participant Susie Wyshak’s blog, Artisan Food Discoveries. At a time when so many farm animals are being raised in confined spaces, it’s always nice to see chickens out on pasture. 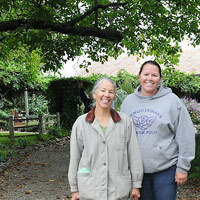 We visited Shelly, saw her brand new chicks, and got to smell and sample the amazing array of culinary herbs she grows. It was a drizzly day, but that didn’t keep her hens inside. See it for yourself — while staying warm and dry — on a photo tour of her farm.